With Lois moving into a shared house for her second year at Durham, and Helen starting out in Hereford, both are needing to fend for themselves for the first time. All students need dhal to survive – I ate very little else when at Sheffield and Leicester, as far as I recall. So how is it begotten? Well I’ve not referred to a recipe ever, but I remember watching someone making it in Sri Lanka, and that probably inspired my method. And my dhal has always been flexible in the extreme, according to what’s in the cupboard. But here’s a basic version, which I’ve just tested for the quantities. This dhal can be served on toast/chapati (etc), or as a side with a curry. Or eaten with a spoon out of the pan. Water (nearly two mugs, i.e. approx. 3-4 parts water to 1 part lentil). Chop the onion and carrot and put in a medium saucepan with the lentils, cinnamon stick and water. Bring to the boil then reduce to a simmer for 15 minutes. Check every now and then that it is not getting too dry, and add a little more water if so. While this is simmering, Finely chop the chilli and garlic. Heat the oil in a pan until hot but not actually smoking. Seeds should sizzle when dropped in. Add the Panch Puran seeds, then the chilli and garlic. Fry and swirl about a bit until the garlic is browning then remove from the heat – you don’t want burnt seeds and garlic, but a bit of browning is tasty. This takes less than 30 seconds if the oil is at the right temperature. If you burn it, chuck it away and do a new lot, or the dhal will be horrid. In this photo the lentils are coming to the boil and we’ve fried the spices and whipped them off the heat. 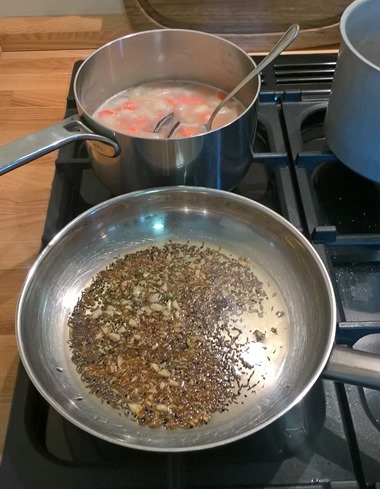 When the lentils are cooked, add about half a teaspoon of salt, then more to taste until it’s definitely not bland. Add some lemon or lime juice at this stage – perhaps half a lime would do. This changes the character of the dish dramatically, so try it with and without, and see which you like. I prefer without. 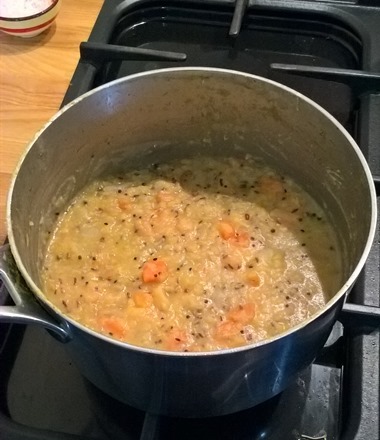 Now bring the spicy oil back to a sizzling temperature, then pour it into the dhal pan with all the seeds – there should be a satisfactory whoosh. Stir it in, but no need to be too thorough. The thing can be eaten now, but really benefits from a few hours standing around with a lid on. Before serving, stir in and garnish with some fresh coriander (unless you hate the stuff! ).